Amazon Price: N/A (as of April 21, 2019 9:52 pm – Details). Product prices and availability are accurate as of the date/time indicated and are subject to change. Any price and availability information displayed on the Amazon site at the time of purchase will apply to the purchase of this product. 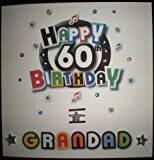 This colourful card for a beloved Grandad features a fun and funky, stylish text 'mash up' with a visual effect that makes it look like the letters, numbers and quirky collection of characters are jumping out of the card. Metallic studs, a sprinkling of glitter and card candy embellishments are wonderful additions to this fun-filled card making it both a visual and tactile joy for its recipient.